Beeliar Primary in Perth Western Australia. It is a medium size school of around 500 + students. I teach the pre primaries year they turn 5 years up until the year they turn 13. 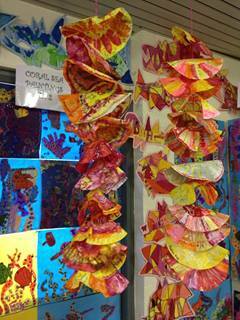 Visual arts is very strong and well supported in our district. I used the coffee filters, coloured them with water based felt pens . the students added final patterns with gold and silver permanent pens and then I sprayed them with liquid starch. I then strung them together with wool to hang . A simple project with great results!